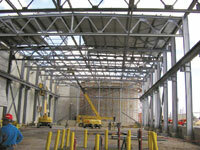 Ocean Steel has extensive experience in fabricating and erecting structural steel for the Pulp & Paper industry. Irving Paper has grown to become one of Canada's foremost newsprint and specialty paper mills. This 20,000 square foot expansion included a 100 ton overhead crane in order to facilitate the storage and maintainance of the vitally important high speed rolls, used by the modern paper machines.